The Ekomedion two-mica granite, southwestern Cameroon, has potential for uranium and molybdenum mineralization. 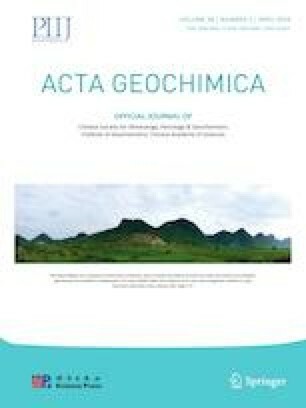 Here, we present LA-ICP-MS U–Pb ages, Lu–Hf isotope characteristics, trace element concentrations and Ti-geothermometry of zircon from this granite hosting U–Mo mineralization in pegmatitic pods. The majority of zircon are CL-dark though some CL-bright cores were also identified. U–Pb zircon age data range from 121 ± 3 to 743 ± 11 Ma with only 5 of 34 ages being near concordant. The concordant mean age of 603 ± 12 Ma is similar to ages of granitic intrusions along the Central African Shear Zone in Cameroon. Apparent ages with mean of 261 ± 6 Ma reveal open system behavior with respect to Pb and/or U. Zircon εHfi values range from − 20.3 to − 0.3. This implies that U–Mo was remobilized during partial melting of the surrounding gneiss. Zircon Th/U > 0.1 as well as an increasing Hf with decreasing Th/U indicates that fractional crystallization was the main factor that controlled U–Mo mineralization in pegmatitic pods. Y and Y/Ho ratios cluster from 29 to 33 close to the chondritic ratio of 28 and indicate fractionation of Y and Ho with low F contents during the earliest stages of crystallization. Late stage accumulation of F-rich magmatic-hydrothermal fluids impacted U–Mo mineralization as a ligand. Zircon contains a prominent negative Eu anomaly pointing to a fractionating system rich in plagioclase. Calculated Ti-in-zircon temperatures span 672 °C to 1232 °C with the temperatures at the high end reflecting interference from mineral inclusions in the zircon grains while the lower temperature values are linked to crystallization. The online version of this article ( https://doi.org/10.1007/s11631-019-00337-x) contains supplementary material, which is available to authorized users. Funding was provided by Alexander von Humboldt-Stiftung (DE).